Valley of the Brain Collectors as a sandbox had plenty of optional encounters. However my players are very focused, it didn’t make sense to their practical hearted characters to disturb every nest in the Scar of the Spider. They stayed on mission. So they actually minimised and avoided contact with the inhabitants totally skipping the Cthulhu Mythos inhabited Fungal Cave. Here is a Thousand-Young. Was kind of disappointed I didnt get to use this guy… thing. Based off the Chaos Beast from 4e and Pathfinder. Corporeal Instability. A creature struck by the claws of a chaos beast must make a DC 16 Constitution save or be cursed with an amorphous body. A creature cursed with an amorphous body becomes a spongy, shapeless mass. Unless the victim manages to control the effect (see below), its shape constantly melts, flows, writhes, and boils. An affected creature is unable to hold or use any item. Clothing, armor, helmets, and rings become useless. Large items worn or carried—armor, backpacks, even shirts—hamper more than help, reducing the victim’s Dexterity score to 1. Speed is reduced to 10 feet or one-quarter normal, whichever is less. The victim cannot cast spells or use magic items, and it attacks blindly, unable to distinguish friend from foe it has disadvantage on attack rolls and a 50% miss chance, regardless of the attack roll. A victim can temporarily regain its own shape by taking an action to attempt a DC 16 Wisdom save. A success reestablishes the creature’s normal form for 1 minute. While cursed and back in its own shape the creature needs to make three successive DC 16 Wisdom saves before reverting to cure the curse. Each successful save increases the DC of the next attempt by 1d4. Spells that change the victim’s shape (such as alter self, beast shape, elemental body, and polymorph) do not remove the curse, but hold the creature in a stable form (which might not be its own form, depending on the spell) and prevent additional exhaustion levels for the duration of the spell; shapechange and stoneskin have a similar effect. The victim gains 1 level of exhaustion from mental shock every round that it ends its turn in an amorphous shape—upon gaining five levels of exhaustion, further drain ceases and the amorphous body effect is permanent until removed via magic (no further number of saving throws can cure the condition at this time). Resistant to Transformation. Transmutation effects, such as polymorphing or petrification, force a chaos beast into a new shape, but at the start of its next turn, it immediately returns to its normal form as a bonus action. Thousand Young. As a bonus action, the chaos beast can expend a spell slot to cause its melee weapon attacks to magically deal an extra 10 (3d6) psychic damage to a target on a hit. This benefit lasts until the end of the turn. If the chaos beast expends a spell slot of 2nd level or higher, the extra damage increases by 1d6 for each level above 1st. Multiattack. The chaos beast makes three attacks with its claws. Claws. Melee Weapon Attack: +7 to hit, reach 5 ft. , one target. Hit: 8 (1d10 + 3) slashing damage plus corporeal instability. 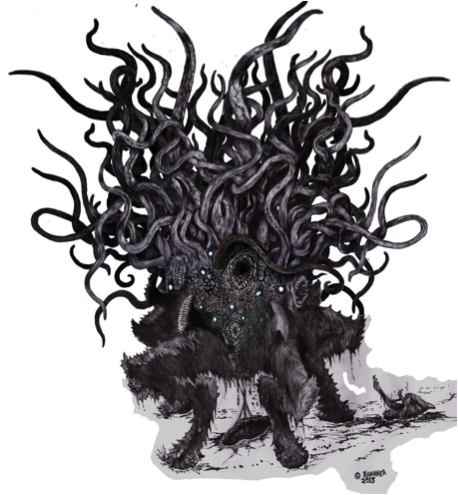 This thing is a horrid mass of barbed tentacles, glaring eyes, and gnashing teeth, twisting upon itself and reshaping into new forms. It seems to be plant like in nature. Seems like a lot of fun, and suitably nasty. I like it. Thanks. Thought thematically it fits really well. I suspect the original writer probably had similar ideas but due to space had to go with something generic. I can see he did well leveraging the Cthulhu mythos generally.